Canis Major or Sirius was designated the “Dog Star” by ancient astronomers. Romans believed that Sirius rose before or at sunrise, convinced this star was the cause of hot, sultry weather. To appease the rage of Sirius and believing that the star caused the pattern, they sacrificed a brown dog, thus the reference – Dog Days. Ancient Rome cataloged the Dog Days from July 24 through August 24 and The Old Farmer’s Almanac lists the traditional timing as the 40 days from July 3 to August 11. Since June 20, the sun has reached its highest point and slowly begins its track toward the equator. For 2016 we have recorded eight 90 degree days in May, 22 in June and 24 days in July. Our average last 90 degree day is October 1st with the latest 90 "degree-er" on October 26, 1939. With an average of 90 days in the 90s we have recorded 54 days while 2015 recorded 105 days in the 90s. 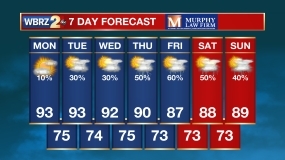 Stay cool for another 55 days and then we'll say goodbye to the steam, heat and high humidity.